« Go to this shopping site and try to buy something. - When I actually yell out Holy Crap during a clip, you know it's good. - Stallone as Charles Bonson in the Death Wish flicks...I could see it. - Anyone taken any iTunes courses? Apparently 4 million people have. 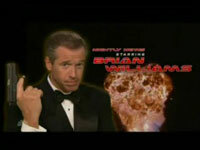 - And Brian Williams did a good job on SNL this weekend...you decide.